The Secret Life of Bees set in Johannesburg, now in paperback. A perceptive and searing debut about Apartheid South Africa, as told through the story of one unique family brought together by tragedy. Life under Apartheid has created a secure future for Robin Conrad, a nine-year-old white girl living with her parents in 1970s Johannesburg. In the same nation, but worlds apart, Beauty Mbali, a Xhosa woman in a rural village in the Bantu homeland of the Transkei, struggles to raise her children alone after her husband's death. Their meeting should never have occurred...until The Soweto Uprising, in which a protest by black students ignites racial conflict, alters the fault lines on which their society is built, leaving Robin's parents dead and Beauty's daughter missing. In the aftermath, Beauty is hired to care for Robin, and the two forge an inextricable bond through their deep personal losses. But Robin knows that if Beauty reunites with her daughter, Robin could lose her new caretaker forever, so she makes a desperate decision with devastating consequences. Told through Beauty and Robin's alternating perspectives, the two narratives interweave to create a rich and complex tapestry of the emotions and tensions at the heart of Apartheid South Africa. 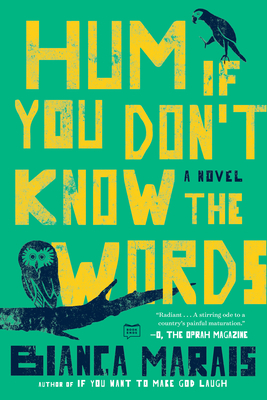 Hum If You Don't Know the Words is a beautifully rendered look at loss, racism, and the creation of family. Bianca Marais holds a Certificate in Creative Writing from the University of Toronto's SCS, and her work has been published in World Enough and Crime. Before turning to writing, she started a corporate training company and volunteered with Cotlands, where she assisted care workers in Soweto with providing aid for HIV/AIDS orphans. Originally from South Africa, she now resides in Toronto with her husband.